One Book Rightly Divided: The Key to Understanding the Bible, by Dr. Douglas Stauffer, is included in electronic form in the SwordSearcher Deluxe Study Library. 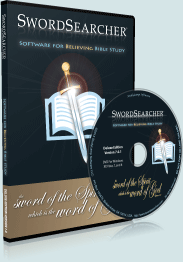 This is the Second Edition (Expanded) and specially formatted for SwordSearcher Bible Software. All scripture references are hot-linked for fast biblical study. As with any other SwordSearcher book, One Book Rightly Divided can be linked right in the Bible margin for quick verse-based access. It can be instantly searched for key words and phrases and is fully indexed in the Verse Guide. Read a short biography of Dr. Stauffer here. Special SwordSearcher Digital Edition copyright 2008, used with permission. Helpful tips: You can add One Book Rightly Divided to your Bible margin by going to the main Bible menu and choosing "Select items for Bible margin links." The SwordSearcher abbreviation for this book is StauOBRD. Also, you can make the book panel tab for this book permanently visible by choosing "Select which tabs to show" from the main Tabs menu. Finally, to see how this and other books integrate into a study flow in SwordSearcher Bible Software, watch the video How SwordSearcher Works with Books. Since becoming a Christian in 1980, I have heard many negative statements regarding the word of God. These include allegations that the Bible contains contradictions; suggestions that you can make the Bible say whatever you want it to say; and assertions that we should not take the Bible so literally. As a seasoned preacher, I have thankfully come to realize that these statements are not insurmountable. God clearly states that He wants us to know what is right. "And ye shall know the truth, and the truth shall make you free" (Joh 8:32). Although the statements in the first paragraph seem to contain some validity, none can be accepted without further consideration. The truth is that the Bible contains no contradictions; therefore, every alleged contradiction can be explained. Likewise, a person attempting to make the Bible say whatever he wants it to say can do so only by disregarding proper scriptural context. Finally, the Bible should be taken literally whenever God expresses a truth that He wishes us to apply literally. My purpose in writing One Book Rightly Divided is to give the student a better understanding of how to properly interpret God's word. The book of Nehemiah clearly expresses my desire, "So they read in the book in the law of God distinctly, and gave the sense, and caused them to understand the reading" (Ne 8:8).Every teacher and preacher should hunger and thirst for a greater comprehension of "what saith the scripture," thus enabling him to correctly teach others (2Ti 2:2). Proper interpretation is the key that unlocks the scriptures. Consequently, the student must allow the Bible to interpret itself naturally without forcing his own private rendering into the text. "Knowing this first, that no prophecy of the scripture is of any private interpretation" (2Pe 1:20). To avoid abusing a passage, one must discover and employ the Bible's own built-in hermeneutical formula as revealed in Paul's letter to Timothy. Study to shew thyself approved unto God, a workman that needeth not to be ashamed, rightly dividing the word of truth (2Ti 2:15). The study of right division focuses on determining the correct doctrinal application of any particular passage. Having determined this application, the supposed contradictions lose their capacity to confuse. Without the discipline of right division, it is impossible to obey the scriptural injunction to ". . . be ready always to give an answer to every man that asketh you a reason of the hope that is in you with meekness and fear" (1Pe 3:15). You cannot be prepared to give an answer if you do not know how to handle the "contradictory" statements found in the Bible. Preachers appear to be weary of having to evade the hard questions because they do not have the answers. For this reason, many have prodded, prayed, and pushed this book into existence. Three distinct groups spurred the writing of this treatise. First, the pastors desired a tool to enable them to teach the Bible dispensationally to their congregations. Secondly, the faculty members of Bible colleges and seminaries grew tired of skipping or spiritualizing the difficult passages, as do their commentaries. Thirdly, church members wanted a Bible study tool for their personal use. Thus in December, 1996, at the prompting of Dr. Bill Grady, I began collating the information to publish One Book Rightly Divided. Due to the aforementioned controversy surrounding God's word, some people may be tempted to judge this book without reading it. Such a disposition reflects a failure to heed the scriptural admonition found in Pr 18:13, "He that answereth a matter before he heareth it, it is folly and shame unto him." Before you pass judgment on this book, open to page one and begin reading. Because of the advanced material contained in the latter half of this book, the individual chapters were designed to be studied in sequential order. Without the foundational principles supplied in the earlier chapters, the student will have difficulty grasping the more advanced concepts. This book is not recommended for the spiritually weak in heart. Although the study of right division will open the word of God to you, unexpected consequences will also be encountered. For every question that is answered by applying these principles, other questions are certain to arise. Thus, the student will be compelled to continually search the scriptures for further answers (Ac 17:11). The same verse that commands us to study and to rightly divide also calls us workmen. It is my sincere prayer that One Book Rightly Divided will bring glory to the Lord Jesus Christ by "endeavouring to keep the unity of the Spirit in the bond of peace" (Eph 4:3). 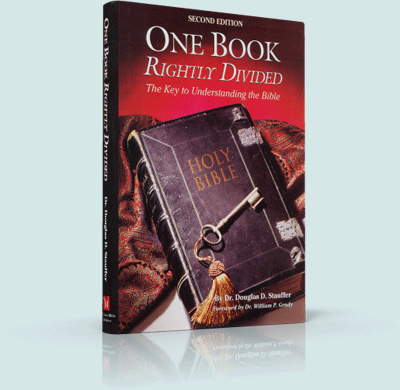 I have found that if the brethren do not "rightly divide" the book, the book will divide the brethren. May the Lord richly bless you as you seek to serve Him. Also included: Reviving the Blessed Hope of the Thessalonians, When the End Begins.